Originally from the UK, moved to Sydney in October 2014 after wanting to do it for more than 10 years! Came for the sun, sea and sand and staying for the sun, sea, food and coffee!! 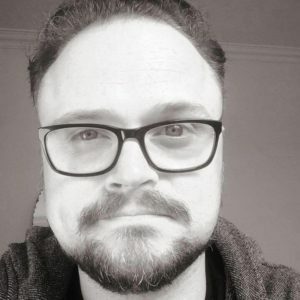 Chris is our resident competitive gamer and has played Warhammer Fantasy since the age of 14 and collects most armies, and amassed significant forces of Ogres, Dark Elves, High Elves, Tomb Kings and mixed Chaos before moving to Australia. 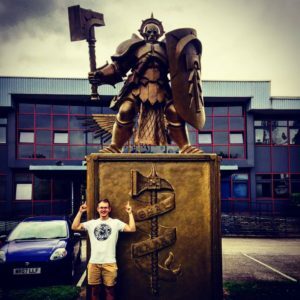 Since moving to Australia and the release of AoS, Chris has embraced AoS in a big way, using it as a way of making new friends, and regularly plays games in the Sydney CBD Warhammer store. While he is still not a big painter, AoS has really boosted his enthusiasm for the hobby aspects of Warhammer and he has painted more models in less than 2 years of AoS than in 10 years of Warhammer Fantasy! Since arriving in Sydney he has embarked on a large Stormcast Eternals army which has been his main hobby project for the last year. His most recent army he has just started working on is Sylvaneth, but also plans to do large Nurgle, Khorne and Tzeentch Chaos armies. Check out his pinned post on his Twitter feed to see just how in to AoS he is! He also has bought a lot of Death models, particularly Nighthaunts as that was going to be a speed paint ethereal army for him, but has put the Grand Alliance Death to the side, as that is the main army of our other host – James. When not Warhammering, Chris likes to keep active by going to the gym, and has become an advanced diver since moving to Australia. His other interests include computer games, though he doesn’t have much time to play them anymore, and keeping up to date with modern film and TV including Game of Thrones, and most things Marvel and Star Wars! Growing up on Sydney’s Northern Beaches, James discovered Warhammer way back in ’94 when he walked past a Games Workshop store and was mesmerised by models on display. Being a massive Tolkien fan, he was instantly hooked, collecting and painting an army of his own. In those early days, James collected Empire and High Elves. Inevitably, as is quite common, James drifted away from the hobby as quite clearly girls and parties became a lot more interesting! However, James never took his finger off the pulse and throughout his 20s would make sporadic sojourns back into the hobby, visiting his local GW and picking up his paintbrush from time to time. During these years James embarked on his long time passion collecting his beloved Bretonnians and really started to get right into painting. Always considering himself a painter more than a gamer, he started getting more into the gaming side of the hobby in the lead up to the release Warhammer Age of Sigmar. Initially nervous about the fate of Bretonnia, he remained faithful and was rewarded with a brand new set of rules for his models and was hooked. James fully embraced AoS after the release and has been an avid narrative and competitive AoS gamer ever since. This past year has seen James delve into his darker side as he embarked upon building his award winning Grand Alliance Death army. Future projects include Stormcast Eternals, a lot of terrain the Spire of Dawn box set and well, lets face it, there’s not one army James doesn’t intend on getting around to one day. When not Warhammering, James spends time with his wife and two fur babies, reads all the books, also loves the Star Wars and other miscellaneous geekery, fronts a rock band and loves to ride his motorbike – in his spare time he sails the seven seas.